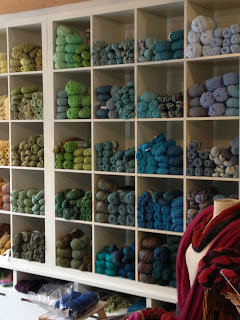 I just found out that the Yarn Along the Rockies yarn crawl will be held again this year. I miss Denver (home for many years) and I plan to go back every year, so this seems like the perfect time to go. 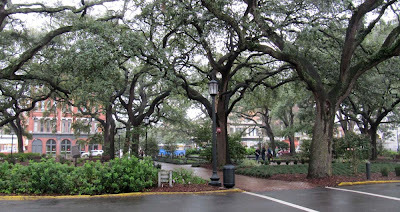 Colorado is lucky enough to have a large number of wonderful shops, even more than what you see on the map. I'd better get some projects finished over the summer so I can justify any yarn purchase I might make in the fall. Might?¿? That's funny. 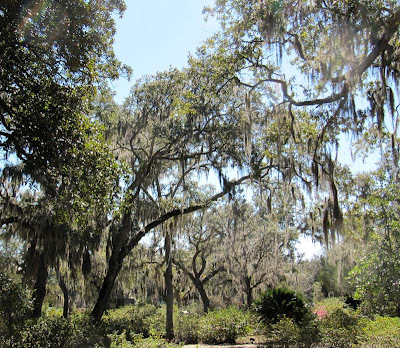 Of course, any trip is made better with visits with friends. I'm already looking forward to getting caught up with them. Monday afternoon will be reserved for the knitting get-together at A Knitted Peace. 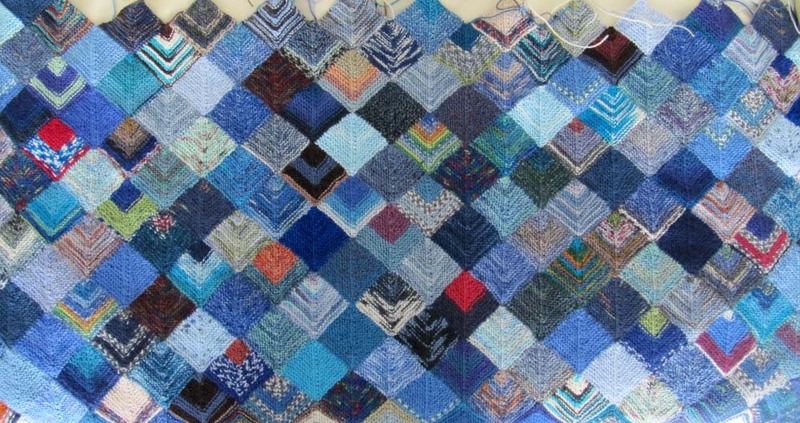 When I started the week I had completed 152 diamonds and 20 edge triangles of my "I've Got The Blues" afghan, picture below. Now I'm up to 191 diamonds and 26 triangles. I'm moving right along at a pace I like. All internal ends have been woven in and I've decided on the yarn that I'll use for the border. 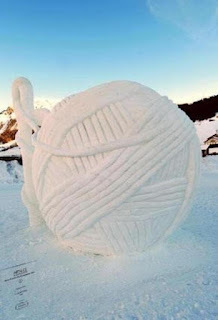 While surfing some knitting sites online (can't remember which ones) I came across a picture that I thought was funny. What a creative use of snow! Now, if the snow here in Calgary would just go away for good, that would be a good thing. 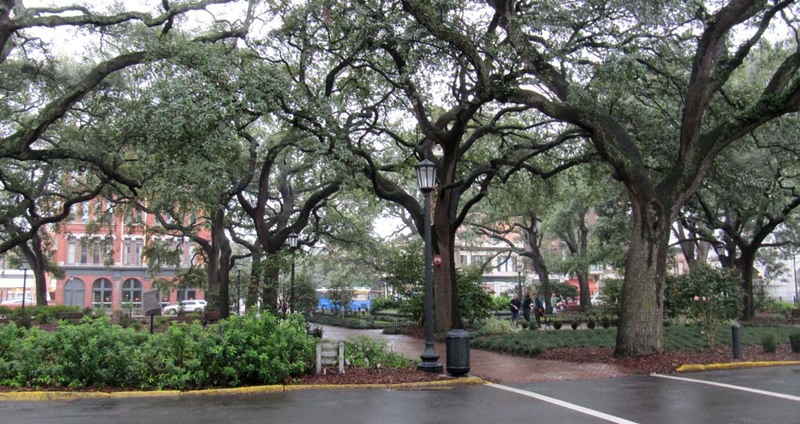 At least I'm getting a reprieve from the cold and snow for a while as I'm traveling to one of my favorite places soon, Savannah, Georgia. 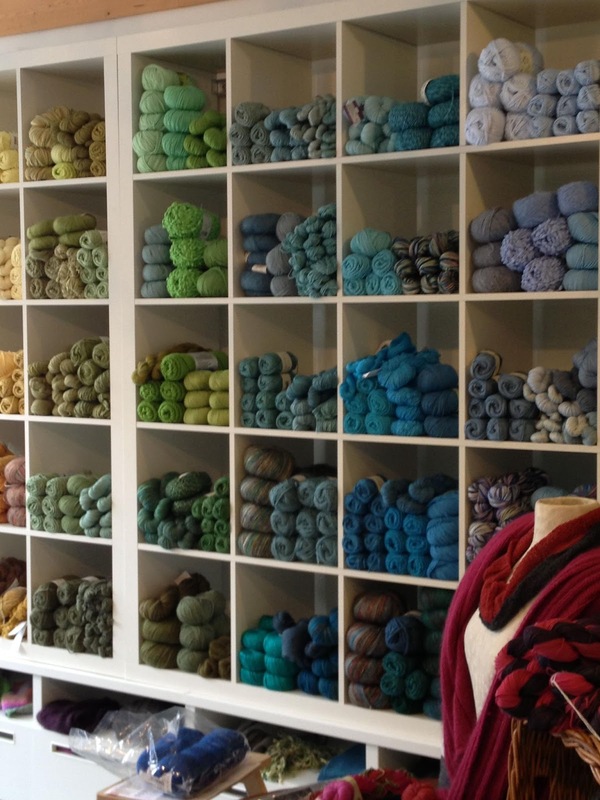 Since I was there last a new yarn shop has opened up, The Frayed Knot. 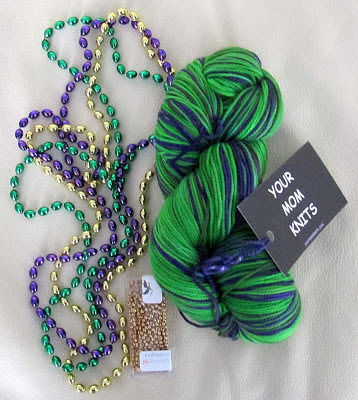 I'm looking forward to visiting and picking up a ball of yarn to add to my Travel Afghan. I already know that they carry a yarn that I like a lot by the Copper Corgi. I've become somewhat of a collector of Copper Corgi yarn. I'd better leave some space in my luggage for "souvenirs" after seeing this photo, and I understand more yarn is arriving. 1x1 ribbing, stocking stitch crown, fairisle lettering. Started with 16" circulars, finished with double-pointed needles. 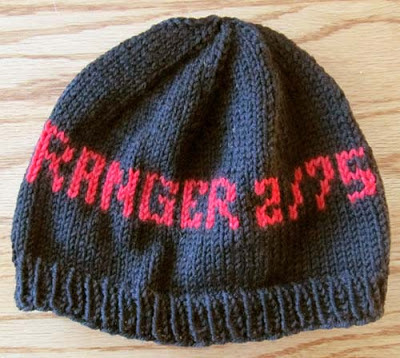 Note: The text is RANGER 2/75 for the 2nd Battalion, 75th Regiment. 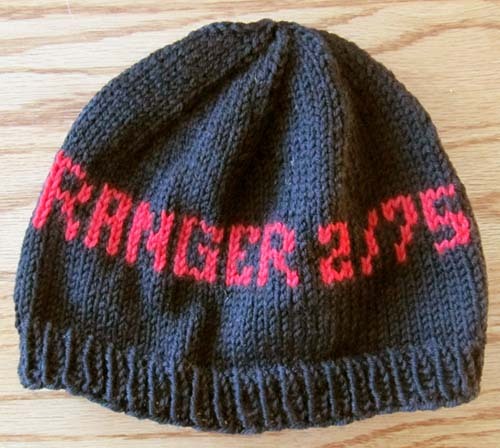 It's knitted twice around the cap. 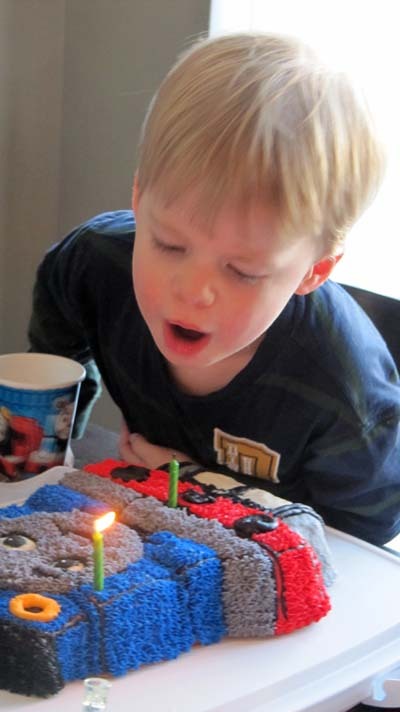 My grandson, Braydon, turned three years old last week and had his birthday party this past weekend. The saying that 'time flies' certainly holds true. He had his little friends over for snacks and cake, along with their parents, and his family. 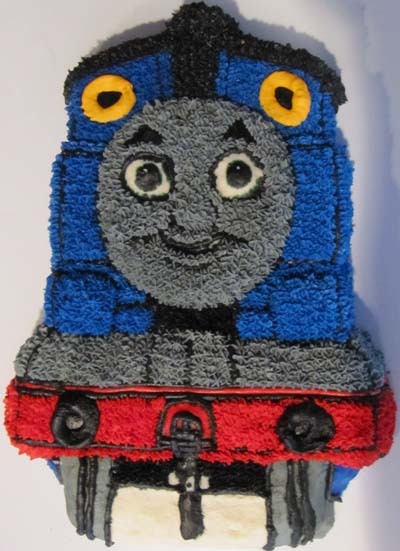 My daughter made him a beautiful Thomas the Tank Engine birthday cake. Braydon is crazy about Thomas and all his friends. I don't know if he made any wishes before blowing out the candles. I brought along a snack, Rainbow Jello. One of my co-workers brought Rainbow Jello to a Christmas potluck and agreed to share the recipe with me. I can't share it further, but I see very similar versions online. It's very easy to make, just takes a bit of time. It's fun and colorful and opens up possibilities to other versions (e.g. 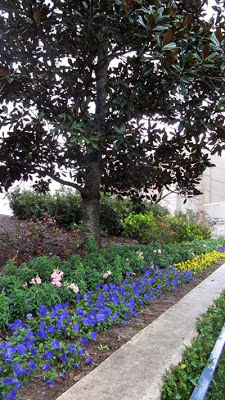 the colors of New Orleans' Mardi Gras, Easter colors, Hallowe'en, etc.). I think it turned out pretty well. The marks on the slice on the piece on the right were from trying to cut the first piece out of the pan.